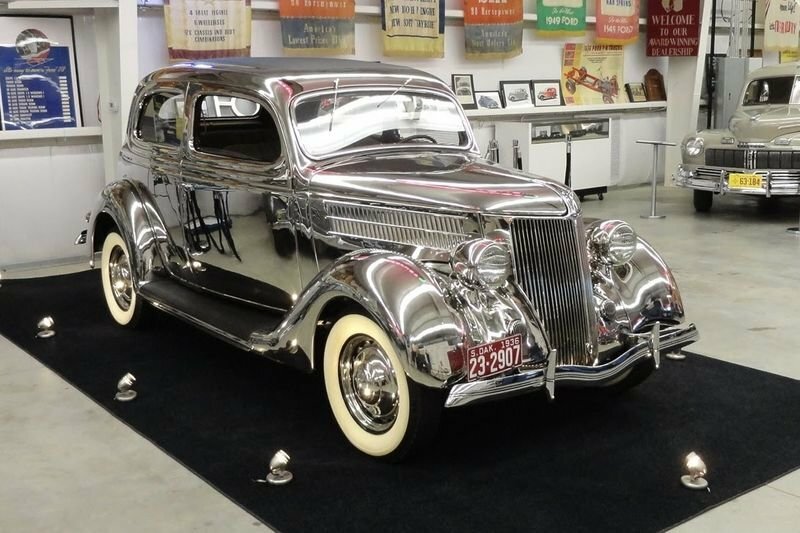 Henry Ford always investigated ways to make his cars to be more durable to ultimately last longer, so Ford investigated stainless steel as a durable, yet rust-resistant option for his cars. In the video below, the car enthusiast from My Car Story travels to Auburn to go and check out the early Ford V8 Foundation and Museum. They take a look at the 1936 Ford stainless steel Tudor deluxe touring sedan model 68-700. They talk to Josh Conrad, who is the Collection Coordinator, and Ron Stauffer who is a Trustee and on the Building Committee for the Museum. The Ford has no paint because it is 1 of 6 original Stainless Steel Cars built by Ford, and there are only four left that are known to exist– so the chance of owning one of these legends are really, really slim. Underneath all the shiny stainless is a standard-issue 1936 Ford. The interior is equally impressive, upholstered in that olive-brown coloured mohair that lots of Fords seemed to have back then, and it's equipped with the desirable Columbia two-speed rear differential. The standard 85 horsepower flathead V8 engine completes the package. The interior door parts are all standard components, and even the interior floor and trunk pans are made of standard metal rather than stainless. If you are interested in seeing this car in person, go to the Early Ford V8 Foundation and Museum, the museum is located at 2181 General Doolittle Drive, Auburn, IN 46706. Or, for those outside the States, go to www.FordV8Foundation.org and view their inventory. Otherwise, indulge in the video below and let us have your thoughts in the comments section. The Ford Bronco U14 Half Cab Pick-up Truck Is A True Vintage-gem! Video: How To Keep Your Car Interior At Its Best!